Cardiac magnetic resonance imaging (CMR) using steady-state free precession is the best method currently available for evaluating the right ventricle (RV). Our objective was to assess effects of age and gender on RV structure and function in a large population of well characterized normal subjects using CMR. We studied 218 (99 male, 119 female) normotensive, non-obese (BMI < 28), non-diabetic volunteers aged 20–90 (mean 54 ± 15) with normal 2-D echocardiograms on a 1.5 T Siemens Sonata scanner. TrueFISP cine imaging was used to obtain contiguous 8 mm short axis slices of the entire RV at end-expiration. Volumetric analysis was performed using Medis MASS. RV volume at end-diastole and end-systole and RV mass were determined and indexed to body surface area (EDVi, ESVi, RVMi) including papillary muscles in the cavity volume. Males had larger EDVi, ESVi and RVMi than females at all ages (p < 0.0001), while ejection fraction was greater in females (58% versus 50%, p < 0.0001). EDVi and ESVi decreased with age in both men and women. Analysis by age decade revealed that EDVi and ESVi begin to fall at 50–59 years of age (p < 0.0001 and p = 0.0003, respectively). See Figure 1. The right ventricle is larger, indexed for body size, in men than in women at all ages, while ejection fraction is higher in women. 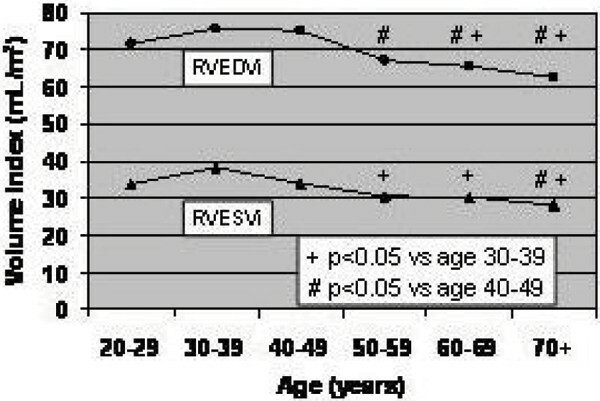 RV size falls with age, showing an abrupt decrement at age 50 in both men and women. The mechanisms underlying this dramatic change remain to be determined.